Lil' Phoebe is really small in size, especially next to her brothers Benji and Chubbs. But that doesn't stop her from bullying them especially Chubbs. Phoebe loves to hide and sneak up on her brothers right after they use the litter box, I don't know why. But it's really cute to see her hiding behind the wall and chasing after Chubbs who will run away like a scaredy-cat! 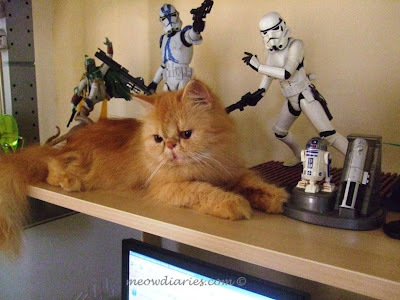 When Phoebe wants to get away from her gigantic brothers for a while and be with friends more her tiny size, she loves hanging out with B's Star Wars toys and figurines. She gets along with them so fine so you can always find Phoebe here if she's MIA. How cute! my buddy said "Mommy, i take the cats okay? 2 only i take!" LOL!! Recent blog post: Come To Me, Goldilocks! aha.. i laik.. I was playing L4D and suddenly i saw a CHOP!. ran fast here. I am sure, my team was like aikkkk as i was Afaik..!! Nasib baik main game bukan full window. Aha, Phoebe kena neck lock.. Yeah Phoebe.. tunjukkan kehebatan "meeeooo".. Happy sebab perut dah lega kot lepas guna litter box.. whoaho!! ye laa Chop nampak keduniaan sebab rakus nak post. Hullahup macam santai datang bertandang sambil main hullahup depan empunya rumah blog. hahahaha 2 only because he kesian you, marzie.. he leave you one and not take all!! LMAO! Great! TAF coming up Shemah woo hoo! Oho.. kesiannya Chubs. Tak per. Janji dia senang hati. Ye laa musti suka nak manja dengan Master. Lagi pun, warna dia kan spesel sket. yalah!! me too!! I've always wanted a pet!! and i'm sure the kids will love them! maybe when i'm living in a house with a yard, I'll get a pet. screw those allergies! LOL! Hahaahha waaahh house with a yard with a maid!!! Hahahaha I wish.. I wish..
:-) hopefully soon kan.. harap2 mulut masin! LOL! Looking and your pics makes me happy, Pheebs! And I remember that pic of you and Benji. I have it here somewhere in my computer. I remember asking Master if I could use it as my desktop wallpaper. B shld get a new display case, Master is so enticed to go to IKEA now! Aww... she is so adorable lah GP... Pheebs.. Aunt LJ missed you!!! and of course.. LJ missed the master too.. hehe.. and oso benji and chubbs!! I'm revisiting this post from your linkwithin dearie.. coz the top picture of Pheebs and Benji is soooooooo cute!!!!!! 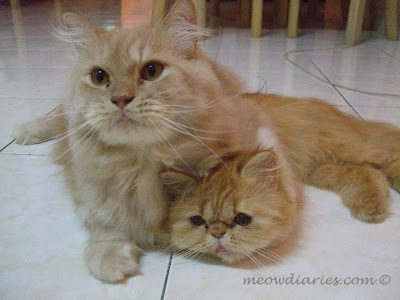 Yay for revisiting, lemme see this cute pic yg mana satu hehehe…meow!